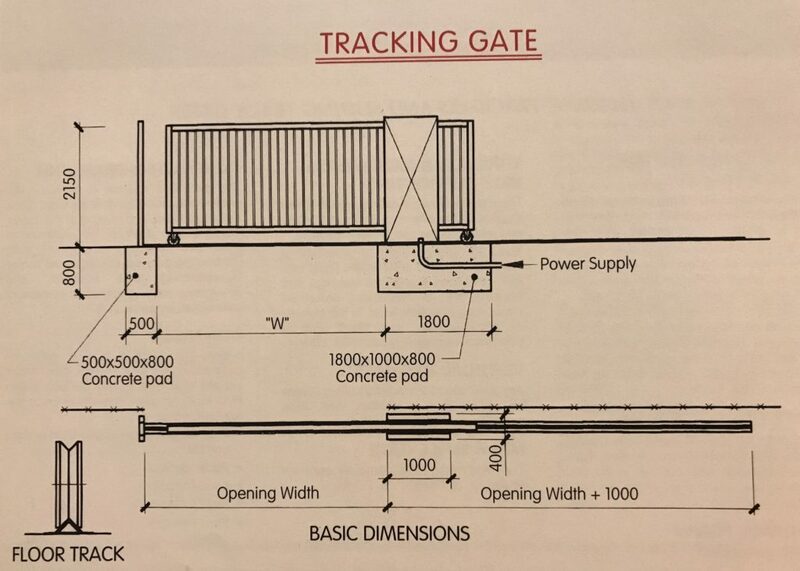 This sliding tracking system allows the gate to be supported on a bottom rail track which is concreted into the roadway. The increased support this gives, allows for a lighter constructed gate, allowing for spans up to 15 metres. 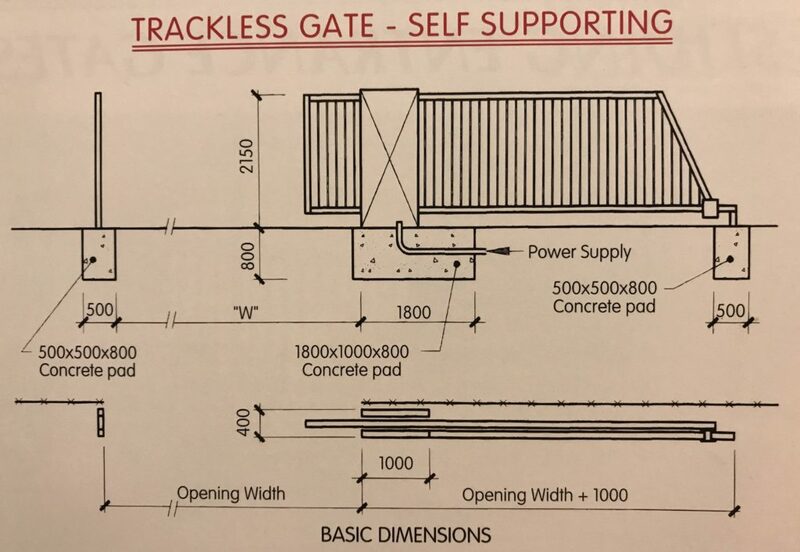 The gate is controlled by the use of floor tracking concreted into the roadway and machined steel ball bearing rollers fitted to the bottom of the gate with vertical supporting guide rollers fixed to the outside of the roadway. The trackless gate systems are designed to slide independent of the road surface and eliminate the use of floor tracking. 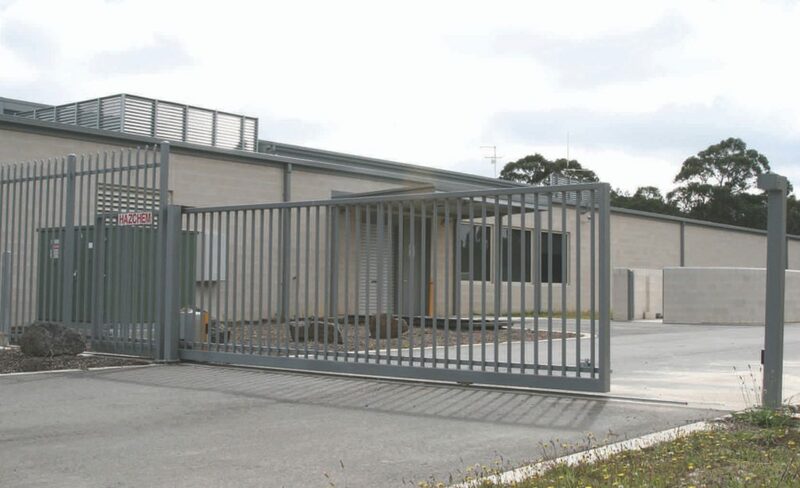 The gate is controlled by a series of heavy duty plated steel rollers fitted with self lubricating sealed ball bearings and housed in a weather protected supporting structure fixed to the outside of the roadway and fitted with a counter levered side guide roller system. Are generally manufactured using 25mm sq. Rolled hollow section steel tube members at 125mm spacings. The weld mesh infills generally used are 50 x 50 sq. or 75 x 50 sq.. The gate will operate at approx. 0.15 meters per second with slow start, slow stop operation, and fitted with PE. Beam safety stop and return. The drive unit to be a two speed, 3 phase. 415 volt, 0.74kw electric reduction motor incorporating limit switches and emergency manual operation in case of interrupted power supply. 3rd Generation Doors offers a wide range of control equipment, from the basic control switches to the hi-tech logic plc multi-function controls or even the fully automatic unit.